The Martin P5M Marlin (P-5 Marlin after 1962), built by the Glenn L. Martin Company of Middle River, Maryland, was a twin engined piston powered flying boat entering service in 1951 and serving into late 1960s in service with the United States Navy for naval patrol. It also served in the U.S. Coast Guard and with the French Navy. 285 were produced overall. Built as evolutionary successor to the PBM Mariner, it had better engines, improved hull form, and more conventional tail. The XP5M Marlin prototypes were based on the last PBM-5 Mariners, the company designation being Model 237. It would be heavily improved again leading to the P5M-2 (Model 237B), which was redesignated SP-5B. A number of P5M-1 models were also used for training, designated TP-5A (after 1962). The Marlin was designed as a gull-winged aircraft to place the engines and propellers high above the spray. Power was by two Wright R-3350 radial engines. The rear hull did not lift sharply from the water at the tail, instead rising up steadily, a Martin innovation; this gave the aircraft a longer base of flotation and reduced "porpoising" over waves. The prototype had nose and tail turrets with twin 20 millimetres (0.79 in) cannon in each, as well as a dorsal turret with two 0.5 in (12.7 mm) M2 Browning machine guns. The cockpit area was the same as the Mariner's. It first flew in 30 May 1948. The first of 167 production P5M-1 aircraft was produced in 1951, flying on 22 June 1951. Changes from the prototype included a raised flight deck for improved visibility, the replacement of the nose turret with a large radome for the AN/APS-44 search radar, the deletion of the dorsal turret, and new, streamlined wing floats. The engine nacelles were lengthened to provide room for weapons bays in the rear. The P5M-1 was followed by 116 P5M-2 planes. These had a T-tail to put the tail surfaces out of the spray, a AN/ASQ-8 MAD boom at the rear of the tail-tip, no tail guns, better crew accommodation and an improved bow to reduce spray during takeoff and landing. 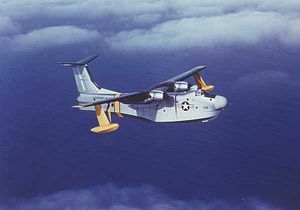 The last flying boat operations of the United States Navy were Market Time patrols of VP-40. Maritime surveillance began in February 1965 to locate small craft transporting supplies from North Vietnam to Viet Cong units in South Vietnam. 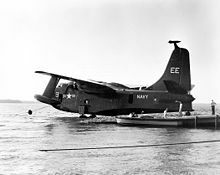 VP-40 operated from seaplane tenders and patrolled off the Mekong delta between Phx� Quốc and Vung Tau. The last U.S. Navy P5M, redesignated as an SP-5B, was flown to NAS Patuxent River, Maryland on 12 July 1968 for interim storage pending construction of display area at the Smithsonian Institution in Washington, DC. As a display area at Smithsonian did not materialize, the aircraft was later relocated to the National Museum of Naval Aviation at NAS Pensacola, Florida where it is currently on display. Seven P5M-1Gs and four P5M-2Gs were built for the United States Coast Guard for air-sea rescue service, but the service found the planes difficult to maintain and surplus to requirements. They were subsequently transferred to the U.S. Navy, which redesignated them as TP-5As and used them as training aircraft, since they had no provision for armament. 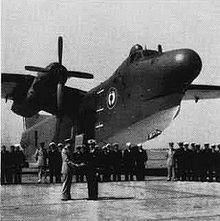 The French Navy took delivery of ten ex-USN Marlins in 1959 to replace Short Sunderlands in maritime patrol service, based out of Dakar, Senegal in West Africa. They were returned five years later. Prototype converted from a PBM Mariner with modified hull. Production model for the United States Navy, 160 built, later re-designated P-5A. Modified P5M-1 for the United States Coast Guard, seven conversions, later returned to the Navy as P5M-1T. Modified P5M-1 with upgraded electronic and anti-submarine equipment, eighty conversion later re-designated SP-5A. Seven former USCG P5M-1Gs returned to Navy as crew trainers and one former P5M-1, later re-designated TP-5A. Updated production model, 108 built for the US Navy and 12 built for the French Navy, United States aircraft later re-designated P-5B. P5M-2 featured T-tail in lieu of low mounted horizontal surfaces in P5M-1. Most P5M-2s were modified with upgraded electronic and anti-submarine equipment, later re-designated SP-5B. Four P5M-2s built for the USCG, later transferred to US Navy as P5M-2s. One SP-5B is located at the National Museum of Naval Aviation in Florida. Believed to be the last remaining example, it is currently displayed outside in poor condition, but is scheduled for partial and, eventually, full restoration. The restoration is being financed by the museum and the Mariner/Marlin Association. Roberts, Michael D. Dictionary of American Naval Aviation Squadrons: Volume 2 The History of VP, VPB, VP(HL) and VP(AM) Squadrons. Washington DC: Naval Historical Centre, 2000. Martin P5M Marlin Pictures and Martin P5M Marlin for Sale.